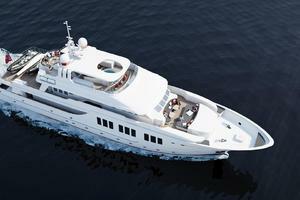 United Yacht Sales New Jersey would love to guide you through a personal showing of this 135' Jfa 2020 2020. 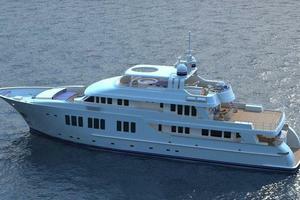 This yacht for sale is located in Unknown France and priced at $4,510,355. For a showing please contact us by filling out the form on this page and we will get back to you shortly! 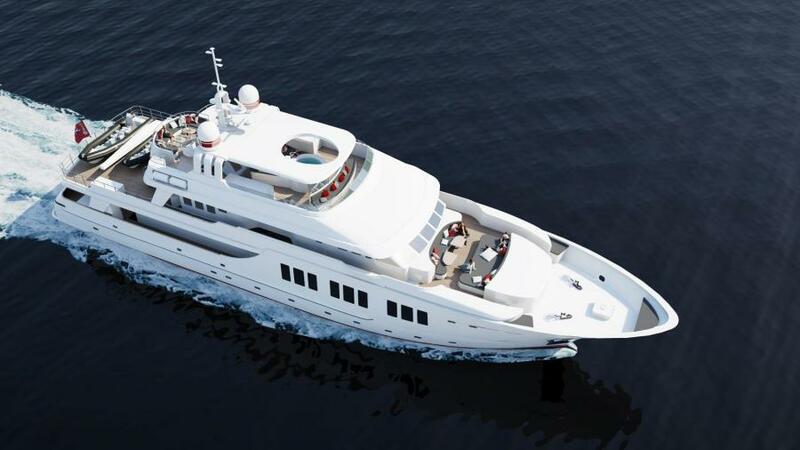 The exterior spaces are large and plentiful, offering guests several relaxing choices from various areas around the yacht, ensuring that everyone finds their own secluded retreat.From Jacuzzi’s and sun pads, to bars and party decks, this yacht has something for every occasion. 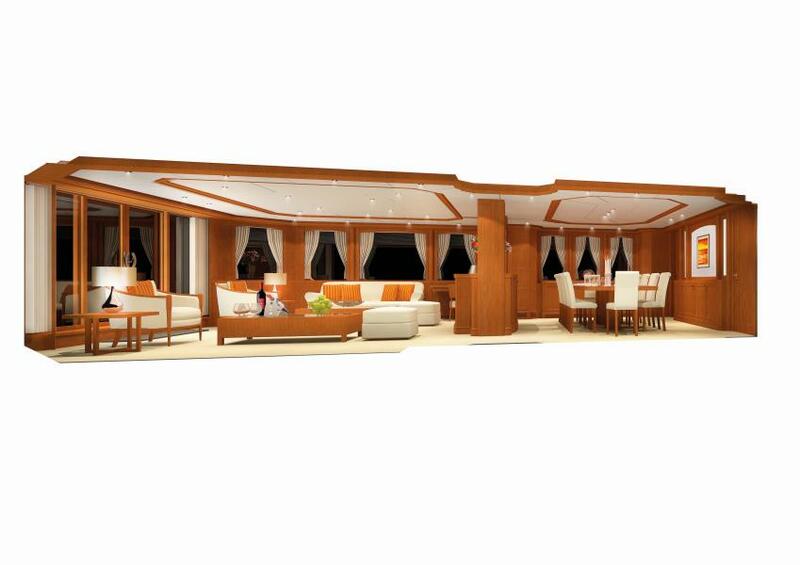 Located on the main deck aft is a large teak dining table which seats 10 or 12depending on thetable configuration, this is the main exterior dining location for the yacht. 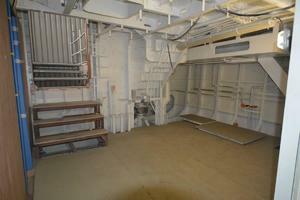 There is a large hydraulic boarding gangway on the aft port quarter, to accommodate stern-to berthing. 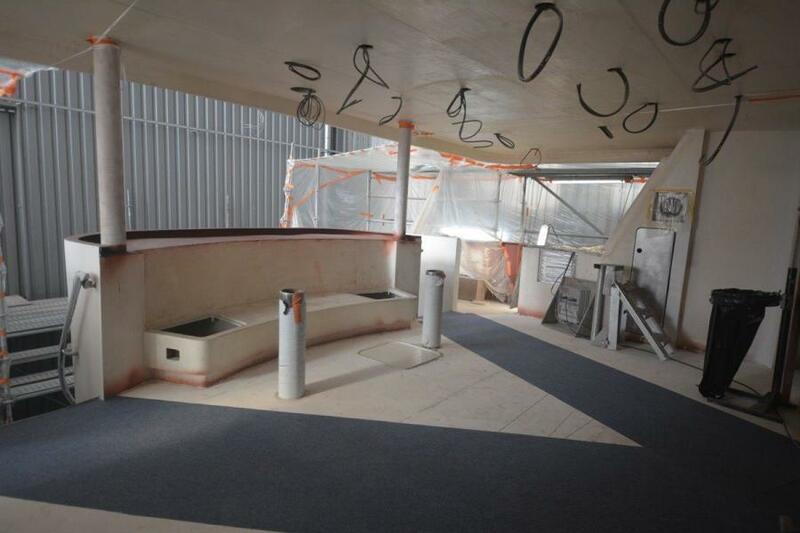 Stairs on each side lead down to the bathingplatform, giving easy access to the water and to the tenders. A shower is also located on this platform. The transom door leads to the sports lazarette where all the yachts toys and water sports equipment is stored. Forward on the bow is the working area with mooring cleats and anchor windlasses. 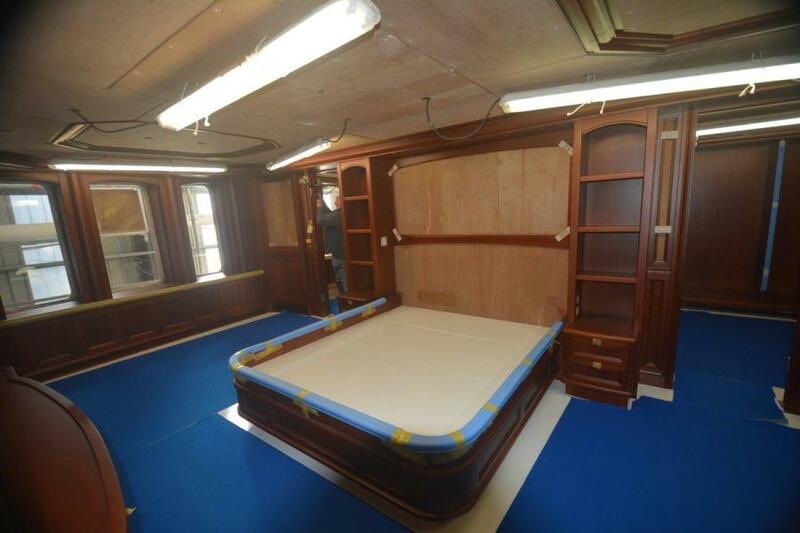 Aft of this is a large storage locker which doubles as an exterior crew space.Just aft of this area is the foreward guest deck, comprising of comfortable bench seating with tables and five large sunpads to offer further exterior relaxing options. 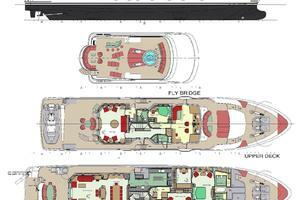 This area can be shaded if required, with large sail shape awnings. 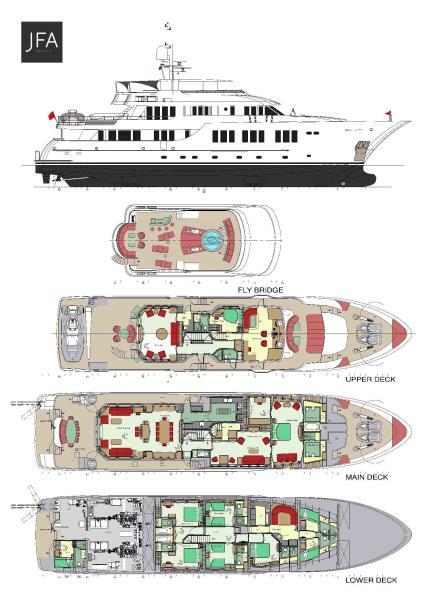 The walk around bridge has excellent visibility with port and starboard bridge wing control stations for easier docking.The aft bridge deck has an intimate seating area, with a small service station is on the port side. Aft are the guest and crew tenders and crane. 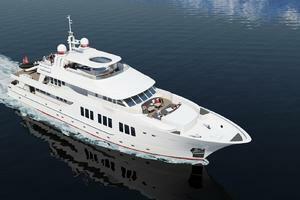 The owner has the option to swap the crew tender for jet skis. 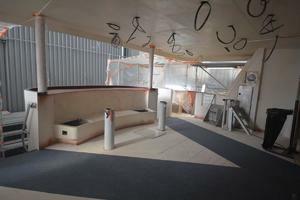 Once the tenders are removed this whole area can be shaded, and turns into an unobstructed entertainment deck. Access to the sundeck is via an exterior staircase from the aft bridge deck.Forward is an almost full beam bench seat for taking in the panoramic views, behind this is a jacuzzi and four sunpads. 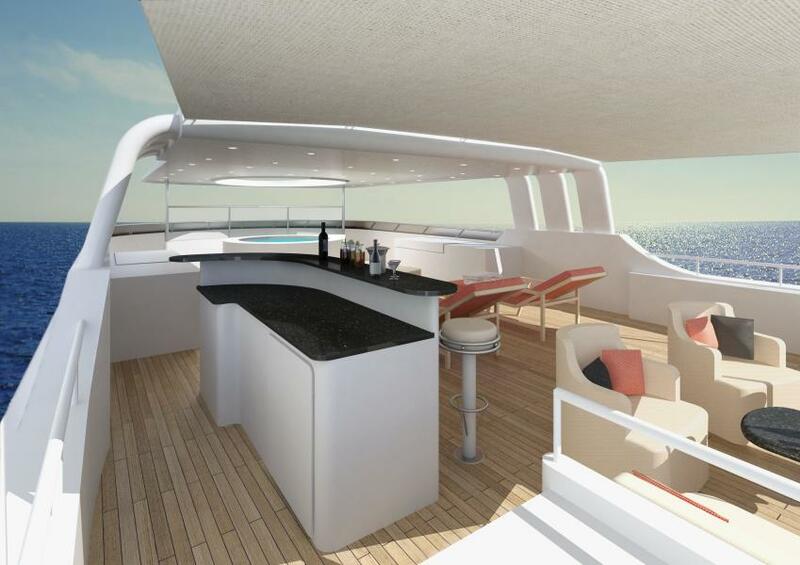 To port there is a full service wet bar, complete with bar stools, refrigerator, ice maker and BBQ.Further aft is a comfortable seating area with cocktail tables and a set of awnings to provide shade. 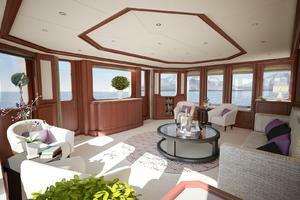 Interior design is by Michael Kirschstein Designs based in Henley-on-Thames in the UK. 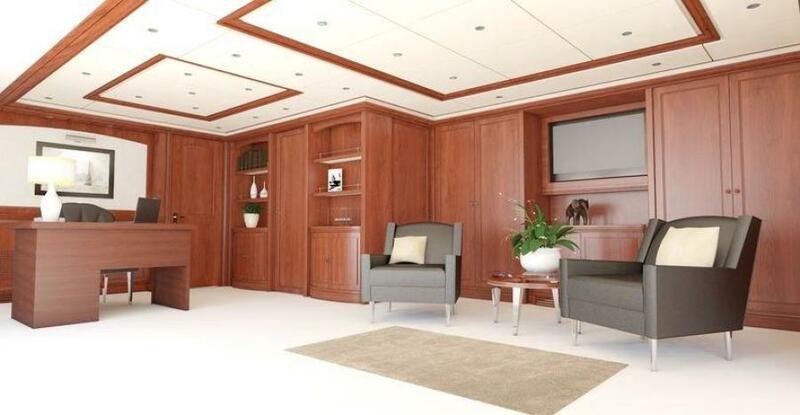 This accomplished studio combines raised paneling in satin finished American Cherry with sunken ceilings, fabric panels and fine carpets to create a relaxed ambience. 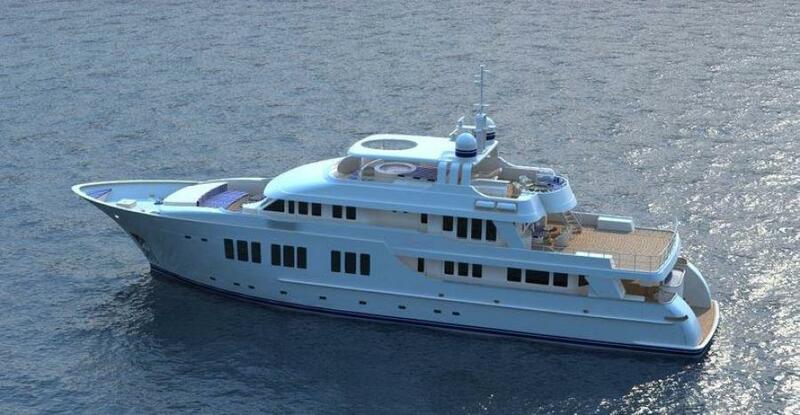 This timeless style will not go out of fashion and will be well suited to any climate this very capable yacht may find herself in.Materials have been chosen to provide the luxurious surroundings expected of a superyacht whilst also being hard wearing and low maintenance. 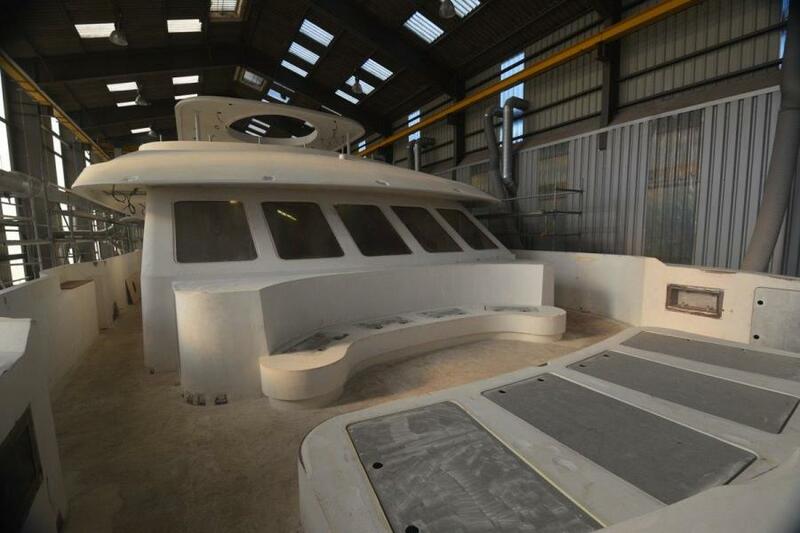 The same mentality has been applied to all aspects of the yacht’s extensive specification.A key aesthetic design focus was to allow a large amount of natural light to flow into the yacht and this is superbly achieved through the extensive use of oversized picture windows. 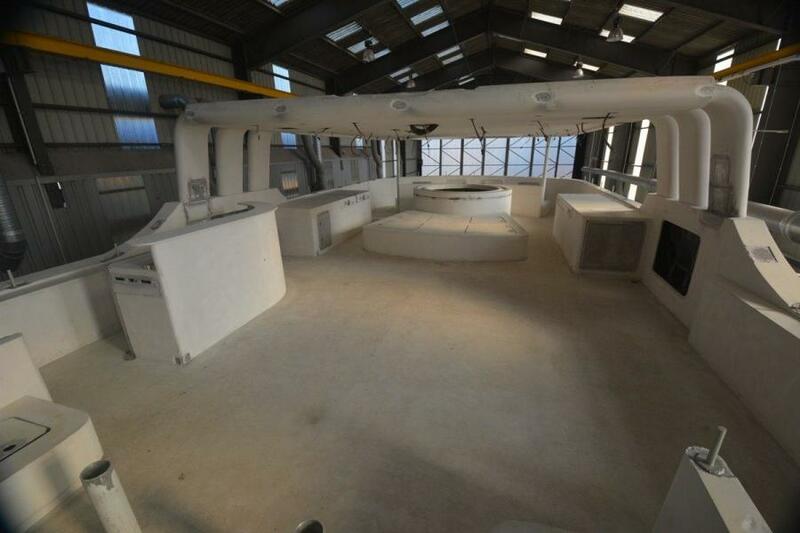 Careful consideration was also given to operational practicality and this effort has resulted in a yacht that is versatile and will prove easy to operate. 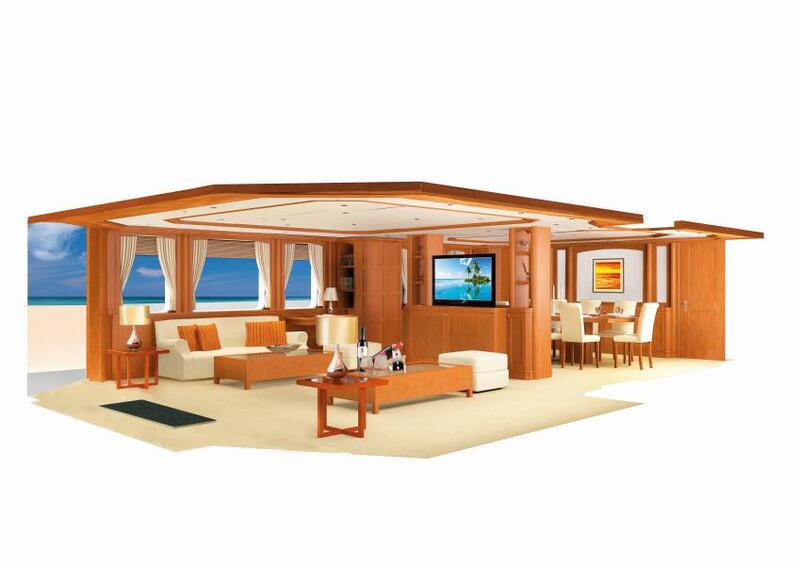 Located forward on the main deck the 73sqm owner’s suite is very large for a yacht of this size.Entering the suite on the starboard side you firstly come to the owner’s study and lounge. Immediately to starboard is a desk with two chairs and bookshelves, further forward is a sofa and armchairs with coffee table providing an area for private relaxation. There is also great storage including ample wardrobe space.This whole area enjoys a large amount of natural light thanks to six very large windows, and a hidden doorway leading to the crew stairwell provides access for a higher level of service.Continuing forward through another door you enter the bedroom. 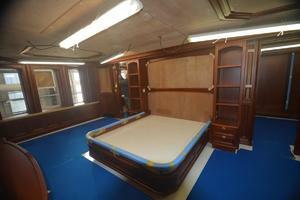 The king size bed is on the yacht’s centerline and faces forward where a large flatscreen TV is wall mounted. To either side are three very large ¾ height windows again allowing in a huge amount of natural light to fill this room.His and her’s bathrooms are situated forward with separate access to port and starboard. Each has a WC, bidet, basin and beautiful fit out including polished marble. 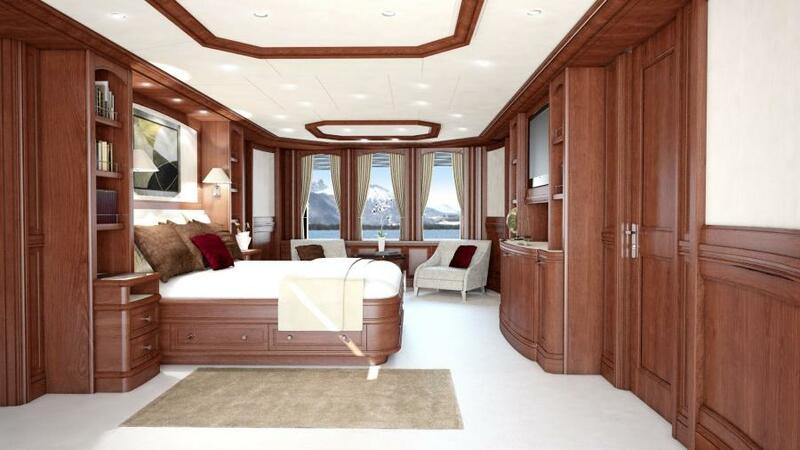 The port bathroom has a bathtub whilst the starboard has a shower.On the port side aft of the bedroom is a dressing room with full height wardrobes, a large chest of drawers, dressing table and full-length mirror. 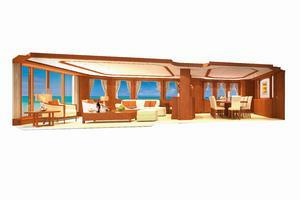 Five guest cabins are located on the lower deck. 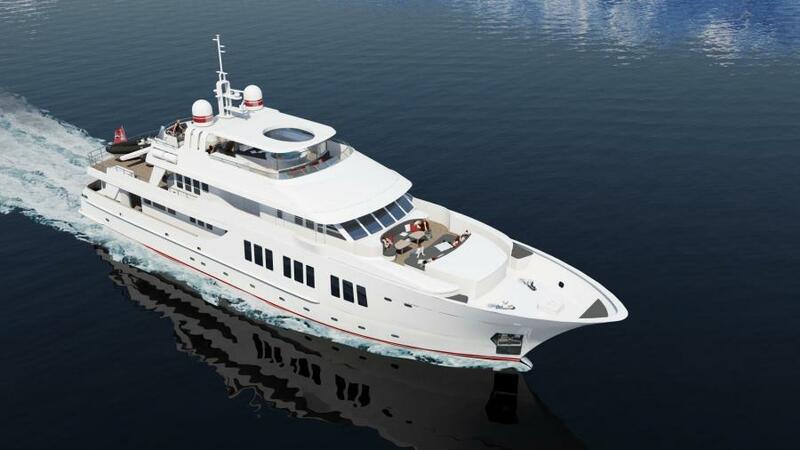 These comprise two VIP cabins with queen size bed, a desk and dressing table, and two twin cabins each with two single berths. 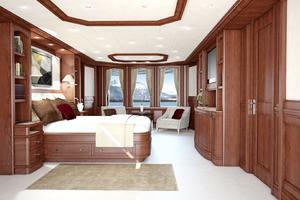 Each cabin has its own en-­suite bathroom with WC, basin and shower. 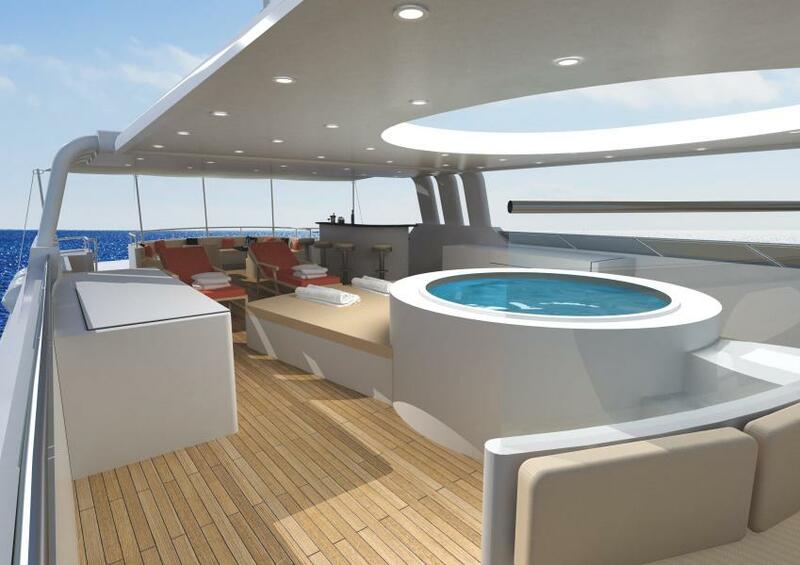 Additionally, the two aft VIP en-­suites each have a bathtub.This deck is easily serviced by the crew thanks to discreet access directly from the crew quarters. 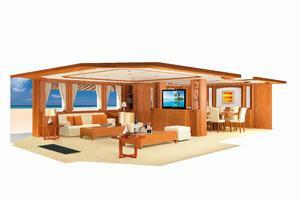 Entering from the aft deck via double sliding glass doors you first enter the saloon. 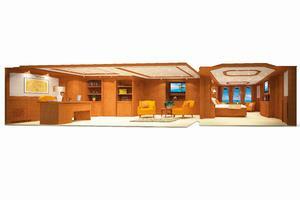 It is symmetrically arranged with a sofa, armchair, ottoman and coffee table to either side and separated the from the formal dining area further forward by a central island cabinet that houses a pop up flat screen TV. 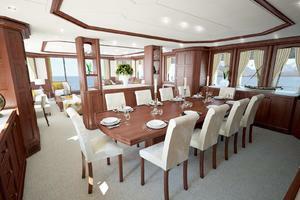 The dining table can seat 12 and is surrounded by plenty of storage for crockery, cutlery, glassware etc. and a wine chiller.Moving forward through a door on the starboard side you arrive in the lobby. Here there is a day head, internal stair down to the lower deck guest cabins and up to the sky lounge, access forward to the master suite and an external door to the starboard side deck leading to the aft deck or up via an external stair to the upper deck.Forward of the dining area on the port side is crew access to a pantry and the professionally equipped galley. 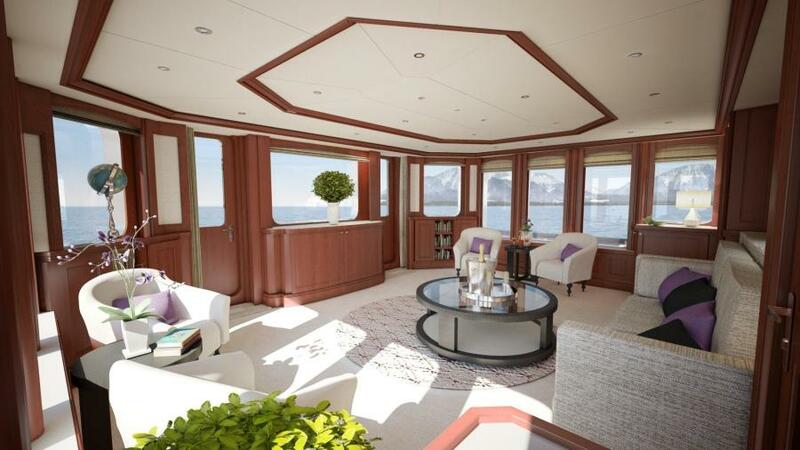 From the pantry an external door to the port side deck allows access to the aft deck and upper deck via an external stair. 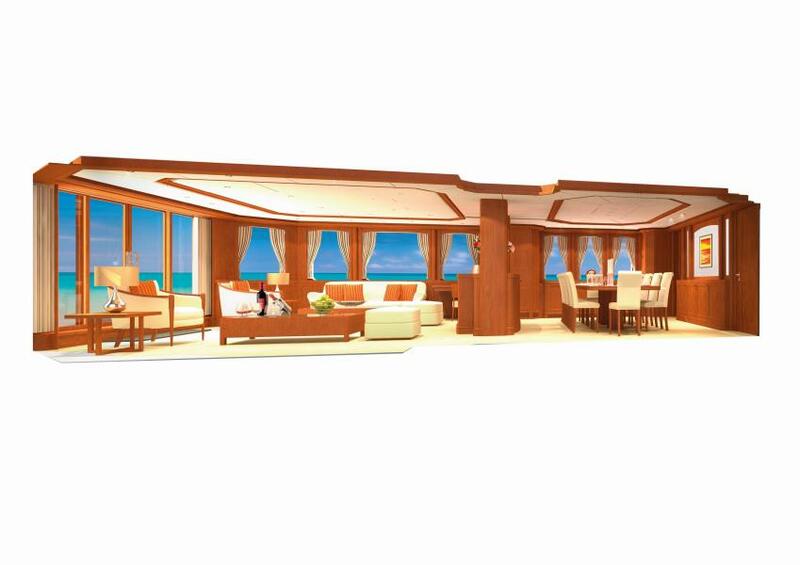 Smooth service is helped by the inclusion of a dumb waiter serving the main deck and upper deck pantries plus the sun deck. 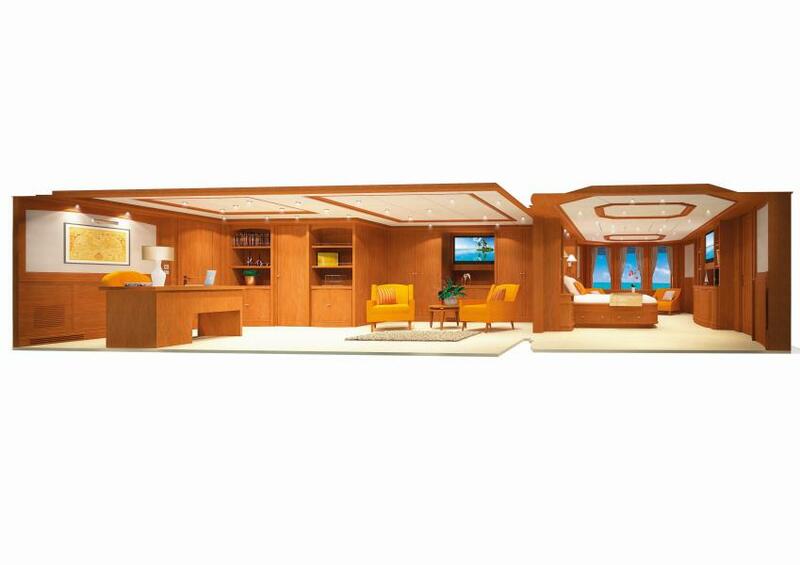 The sky lounge is a cosy area, more intimate than the main deck saloon, with a pop up flat screen TV, built­-in sofa, four loose armchairs, a large centered coffee table with two smaller occasional tables. This is a great location from which to enjoy the stunning views, thanks to the full height picture windows, 13 in total, on three sides.If desired a fold out sofa bed could be fitted in place of the standard sofa to accommodate additional guests. 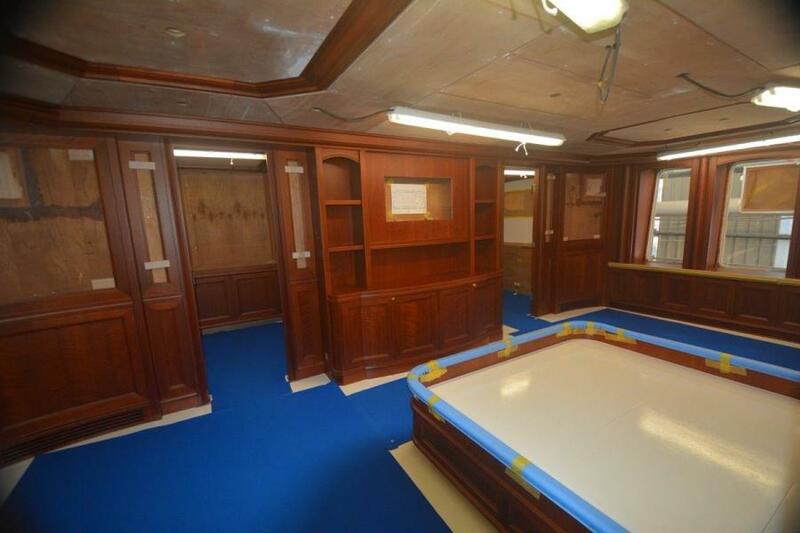 To support this area’s use as a cabin there is a wardrobe and full bathroom with WC, basin and shower in the upper lobby which is directly accessed via a door on the starboard side. 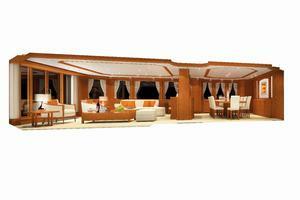 The lobby also provides an external door to the starboard side deck from where you may access the forward or aft decks. 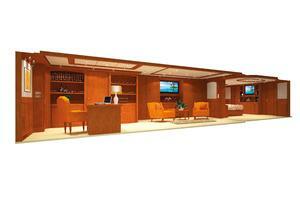 A further practical feature, especially for those using the foredeck lounging area or sun deck, is the external access to the upper deck bathroom / day head.Crew service for the sky lounge is from the large upper pantry via a forward door on the port side.Forward of the sky lounge and lobby is the bridge which is comprehensively equipped in preparation for global navigation. 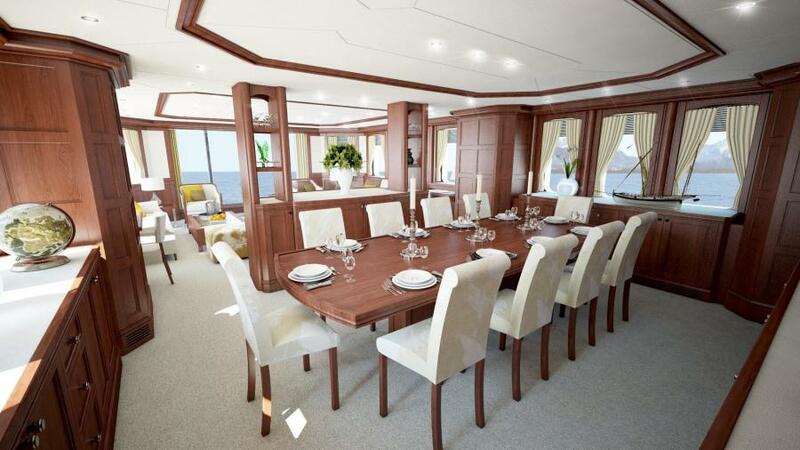 There are two large helm chairs, a ships office to starboard and raised sofa around a coffee table to port that is an ideal place for the owner and any guests to position themselves to be involved in the navigation. Aft of the bridge on the port side is the captain’s cabin with double bed and en-suite bathroom.The main crew area is forward on the lower deck. 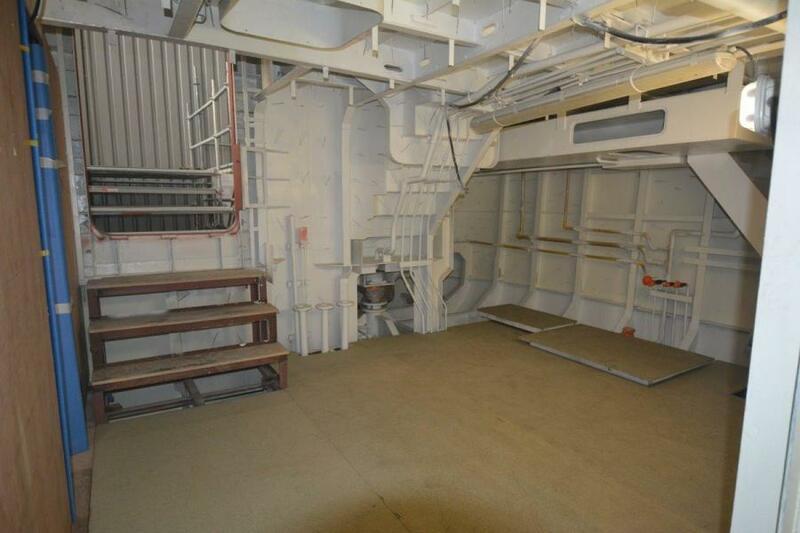 Here there is a crew mess and pantry, the yacht’s laundry and two crew cabins each with two single beds in bunk formation and separate en-suite bathrooms.At the aft end of the lower deck with access from the lazarette is the engineers cabin with two single beds in bunk formation and an en-suite bathroom. 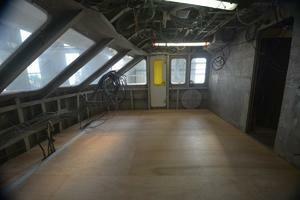 From this cabin the engineers have access directly to the engine room via the lazarette.